My First ‘Official’ Book Review – EEEEK!! “Good fun and a solid recommendation for YA readers.” – How great is that! 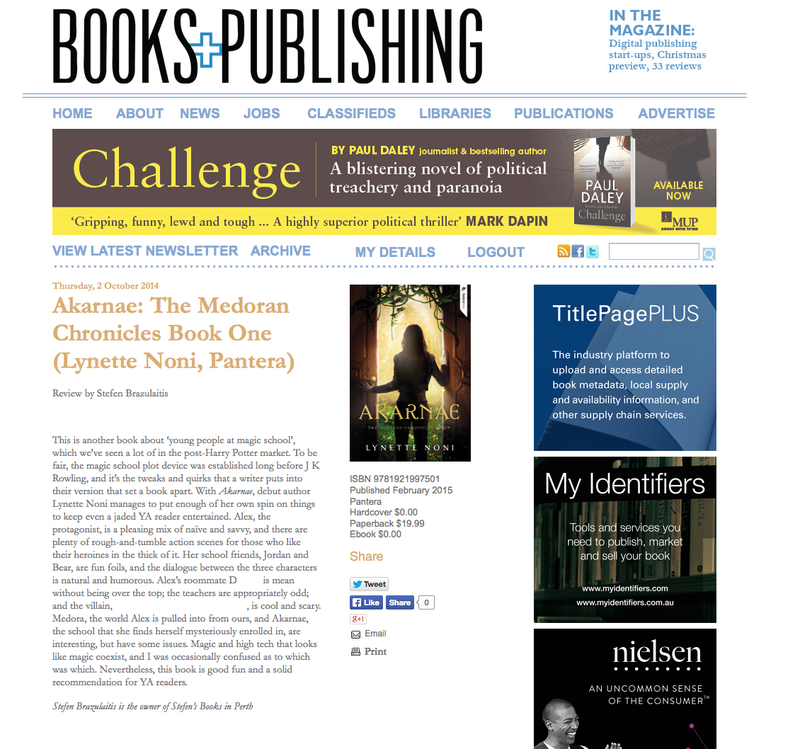 Backtrack: My publishers just sent me the Books+Publishing review for AKARNAE, my YA fantasy novel that’s being released in early 2015. This is the first professional review I’ve received and it will go out in the industry newsletter B+P will send to libraries, bookshops and publishers across Australia. How terrifyingly cool! I’ve whited-out just a couple of words to keep it spoiler-free, but otherwise you can see in the screenshot image below what the reviewer said. You’ll also get a sneaky-sneak view of the cover, which we haven’t officially ‘revealed’ yet just in case of any last minute changes, but that’s the general idea of what it’ll look like. Awesome, right? The cover designers did an amazing job! I’ll upload a proper image once everything is finalised, promise! In other news, I think I’m allowed to reveal my blurb now too, so stay tuned for my next post in a couple of days where you’ll (finally!) read what my novel is about! YAY!